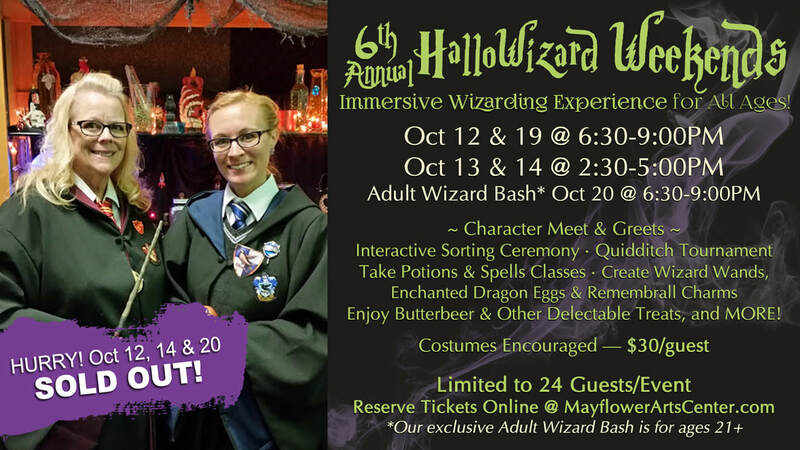 2018 Annual HalloWizard Weekends ~ Immersive Wizarding Experience for ALL Ages! Harry Potter fans... Mark your calendars for our BIGGEST HalloWizard event yet! Join us during October 2018 as we once again transform the Mayflower Arts Center into a magical, interactive world for witches, wizards,and muggles for our 6th Annual HalloWizard Weekends for kids of all ages! Tickets are $30/person and are limited to only 24 guests per event. COSTUMES ENCOURAGED! Advance tickets ONLY -- tickets will not be sold at the Box Office. Due to overwhelming demand, this annual event has been expanded to FOUR nights! FRI, Oct 12 @ 6:30-9PM -- SOLD OUT! SUN, Oct 14 @ 2:30-5PM -- SOLD OUT! FRI, Oct 19 @ 6:30-9PM -- SOLD OUT! ​Plus! Our exclusive Adult Wizard Bash: SAT, Oct 20 @ 6:30-9:00PM -- SOLD OUT! Our Annual HalloWizard Weekends are limited to 24 guests per event, so be sure to get your tickets early because the do sell out! Tickets are $30/person and will go on sale now at https://www.brownpapertickets.com/event/3475468. Don't delay...events sell out every year and tickets will not be available the the Box Office.